Many of us have spent significant stretches of our evenings and weekends recently marking “MEG tests” or the equivalent. 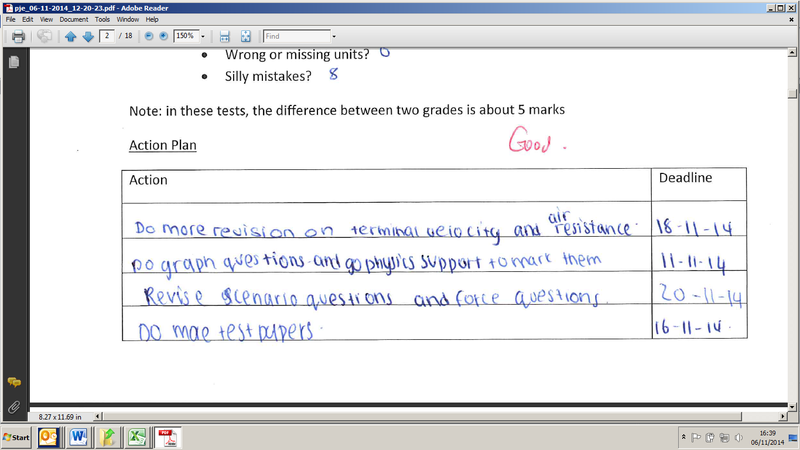 In Physics, our tests are always past exam questions, so what I would normally do is mark one page at a time for a whole class from an exam board mark scheme, then add up the marks for the paper, grade using exam board boundaries and give the papers back to the students, having compared the grades with students’ MEGs. We would then have the “Going Through The Paper” lesson. This is possibly my least favourite of all lessons. The first thing that happens is the students look at their grade. Any teacher who has had feedback from an old-school OFSTED lesson observation knows exactly how this feels. Elation, relief, dejection, despair, outrage: all depending on the single grade that defines whether you are an “outstanding” teacher or student or an “unsatisfactory” one. Any feedback after that, however well-meaning or positive is coloured by that first emotional response, and a road map to improvement is often one of the last things to come into the head. The next thing that happens is that students all want to know everybody else’s grade (think OFSTED again). And so the first quarter of the lesson becomes a group therapy session, at best. The teacher then says something like “Ok settle down, get a different coloured pen and correct your answers, we are going to Go Through The Paper”. Then with varying degrees of skill, empathy, student participation, discussion, use of mark schemes and examiners reports, PowerPoints and model answers, the class will grind through the paper, starting at question 1 and hopefully getting to question n before the end of the lesson. 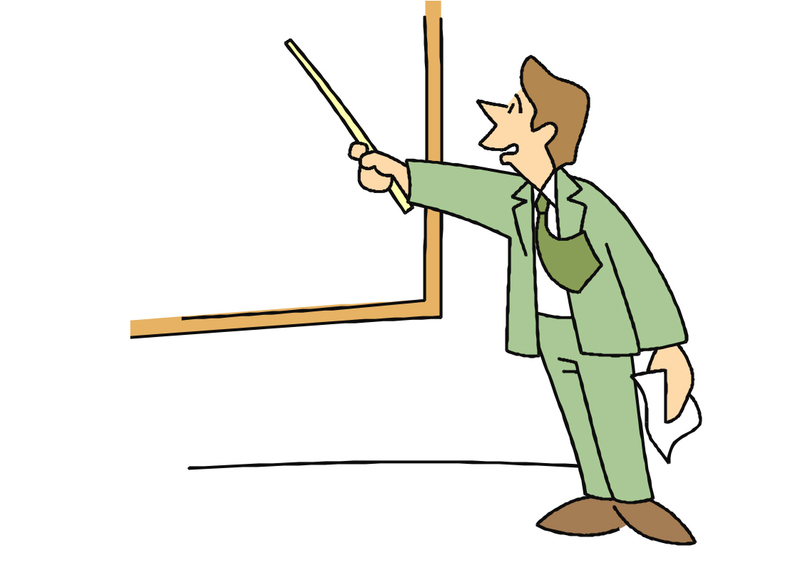 Class boffins will look smug, then bored; barrack-room lawyers will try to squeeze their mark over the next grade boundary by challenging the teacher’s marking; at least one student will cry, during or after the lesson. Having gone through this one more time after the recent MEG tests, I felt I needed to think again. I have long had the practice of never putting a grade on a marked paper, and I always give the grade boundaries at the end of the lesson after I have gone through the marking points. However, in a marks-out-of-x subject like Physics, this is only a partial solution. So I decided to “flip the learning”. 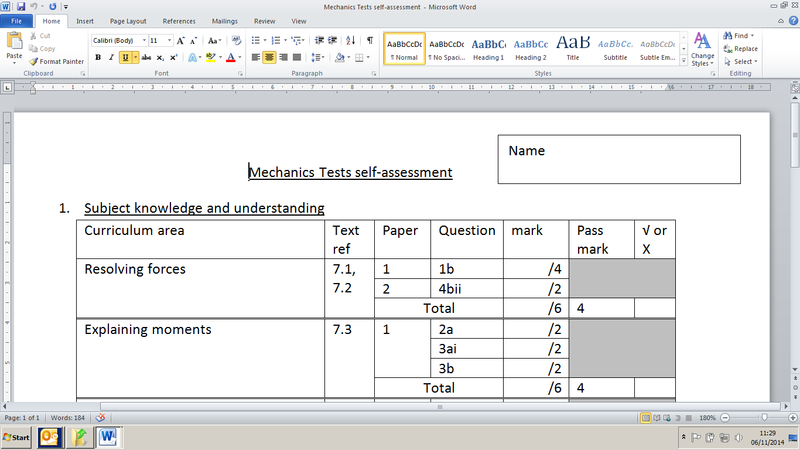 I set all of my classes a couple of redundant test paper on the same topic as the MEG test to be done over half term. I told them that they could do them under self-administered test conditions or could do them open-book, up to them. I took in the work and marked it according to exam criteria, recorded the grade for my records but did not write it on the paper. Contrary to my usual practice, I did not write an overall comment with targets for improvement. 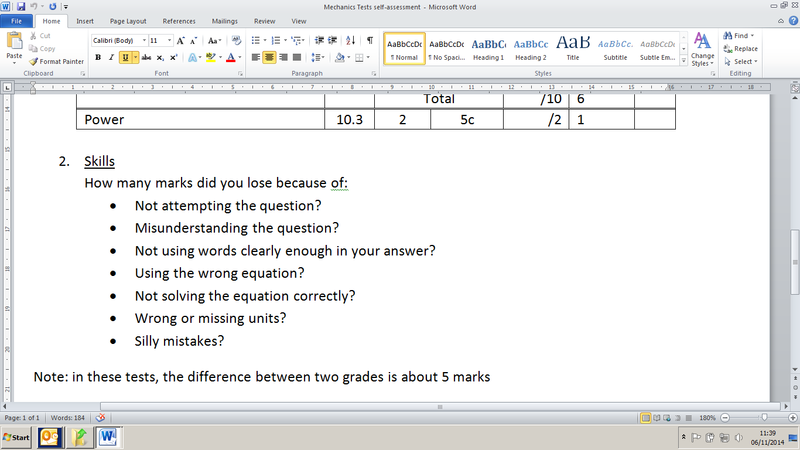 I gave the papers back to the students 10 minutes before the end of the lesson along with a self-assessment sheet. 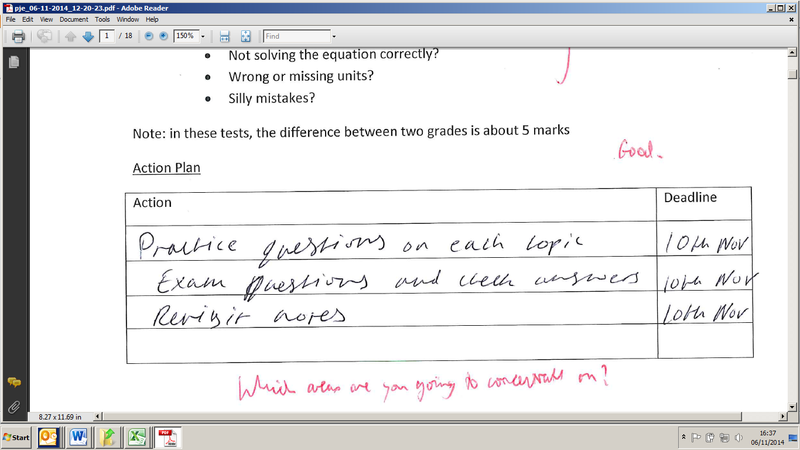 I also told them that the model answers were on QE-online. 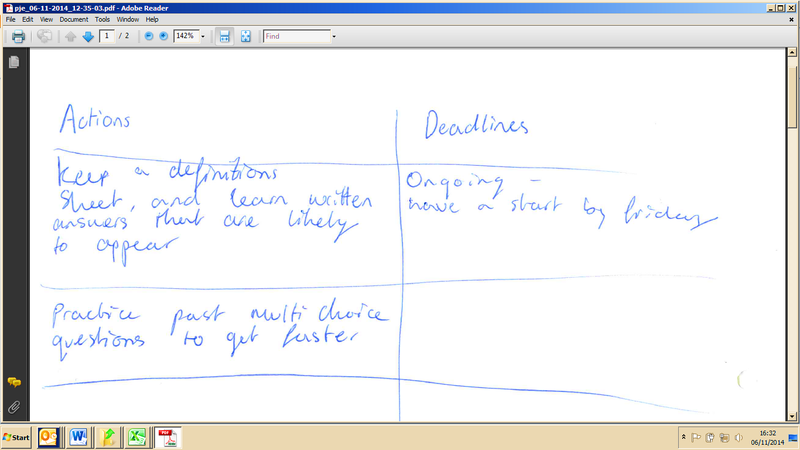 The first section was aimed at getting the students to analyse the paper in terms of marks scored for each sub-topic. In this case for an AS topic, I set an arbitrary pass mark of half-plus-1. With my A2 groups I told them the exam board percentage raw-mark grade boundaries for the unit, then told them to set their own pass mark based on their own personal target grade. The text book reference was there as a pointer for starting to tackle underachievement in the given areas. For my A2 classes I added another similarly formatted section for different question types (multi-choice, numerical and written explanation in their case). In retrospect, I wish I had done this for the AS classes as well. I also wanted students to look at content non-specific areas of their work. Reflecting on why they were missing marks would hopefully focus them on learning behaviour, literacy and numeracy needs and question answering technique. The note was there to concentrate minds on the need for precision and how a series of apparently trivial errors can affect the overall outcome. The students were told to take the sheets home, complete the analysis and write a short action plan (at least 3 actions with deadlines) aimed at the specific topic area. I gave a deliberately short deadline for this, overnight for A2 and two nights for AS, and took them in to look at. The AS group were on the whole less sophisticated about the process and the majority wrote “I must try harder” type responses, as below. However most completed the exercise and a few were quite detailed and well-targeted as below. I would hope that with experience, more students will respond like this. In conclusion, I found this a worthwhile exercise. The sheet took a bit of time to format, but once done it was quite quick to adapt it to other pieces of work. Forcing the students to study their strengths and weaknesses was I feel beneficial, and instead of a whole lesson being devoted to the paper feedback, I spent 10 minutes at the end of a lesson to give out and explain the task and another 10 minutes later in the week to give back out the sheets and make a few general comments. I spent less time on the original marking, as I did not write general comments and targets, and the checking of the responses took about 10 minutes per group. I will try it again next time I set a test. ← Talk to the person next to you!